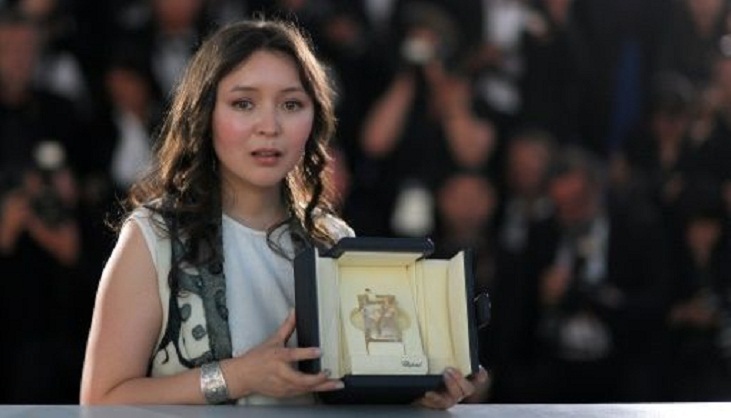 After Kazakhstan's Samal Yeslyamova scooped a surprise award for best actress at the Cannes film festival, many of her compatriots found themselves typing her name into search engines. Yeslyamova -- who won the prize for her portrayal of a Central Asian single mother struggling for survival in Russia in the film "Ayka" -- is not a complete unknown in the country. But nor was she a household name until now. "It's a cause for great celebration, but also regret," said Ermek Tursunov, a film director who lives in Kazakhstan's largest city Almaty. "The lead actress in this film was an ethnic Kazakh girl from northern Kazakhstan, the director an ethnic Russian from southern Kazakhstan," he told AFP. "But it was not a Kazakh film. It was a Russian film." While a small, private Kazakh studio was among those that participated in the making of the film, funding came from the Russian culture ministry as well as the Council of Europe and the Polish film institute. Although oil-rich Kazakhstan had a proud filmmaking tradition during Soviet times, it is better known these days for its portrayal in Sacha Baron Cohen's off-colour mockumentary "Borat". The relationship between Yeslyamova, 33, and director Sergey Dvortsevoy, 55, has been likened by at least one Kazakh website to the partnership between Hollywood duo Quentin Tarantino and Uma Thurman. Dvortsevoy hails from the southern town of Shymkent, which has stronger cultural links to Uzbekistan than to its northern neighbour Russia. Yeslyamova, whose achievement is unprecedented in Kazakhstan, comes from a village near the Russian border and went to college in Petropavlovsk, a town where ethnic Slavs still form the majority population. The pair met during casting for "Tulpan" -- a film set in the Kazakh countryside and filmed in scorching conditions which entered Cannes in 2008 and won the "Un Certain Regard" category, reserved for emerging directors or unexpected or marginal themes. As they flew into the capital Astana on Tuesday, Yeslyamova and Dvortsevoy were met by long-reigning autocrat Nursultan Nazarbayev and a youthful crowd that serenaded her with a national ballad. While both private and state-owned studios in Kazakhstan have vastly increased their output in recent years, critics say that quality has not always followed on from quantity. In recent years, the most prominent titles have been nation-building epics, with big-budget picture "Nomad" featuring American actor Jason Scott Lee proving a relative flop in 2007, drawing criticism for wasting money. Another noted film was "The Sky of My Childhood" (2011) which looked at the early years of Nazarbayev's reign and the country's Soviet past. There have also been a string of comedies in both Kazakh and Russian, aimed at the domestic market. In a country of 17 million with a large rural population, that market is relatively small. Ainur Isayeva, spokeswoman for Kazakhfilm, said Kazakhstan was "incredibly happy" Yeslyamova took the best actress gong and hoped her success at Cannes would "provide a spark" for other local filmmakers and actors. Kazakhfilm, the state-owned studio which still produces most of the country's films, was represented at Cannes by Adilkhan Yerzhanov's "The Gentle Indifference of the World" which it co-produced with a private studio in Paris. "For us, the fact we were at Cannes with that film was already an achievement," she told AFP by telephone. But critics say censorship is still an issue in the local industry, with the authoritarian government preferring uplifting plotlines to tales of woe. And film critic Tolegen Baitukenov says directors often "struggle in the search for finances" for productions which could be seen as showing the country in a negative light. Even those that do win some recognition abroad don't always make it onto the big screen back home, he says, pointing to "Sveta", a compelling horror film about a deaf-mute family facing foreclosure on their home. "As far as I know, there is a question mark over whether anyone here will show it," he told AFP. "Films that explore major social and political problems, the types explored by Polish filmmakers Andrzej Wajda and Krzysztof Zanussi -- you don't see those kind of pictures here at all," says Tursunov. "Cinema is a mirror of the country. When the country improves, so will our film industry."